NVR3–778, a capsid assembly modulator, reduces serum levels of hepatitis B virus (HBV) DNA and HBV RNA in mice with humanized livers and stable HBV infection, researchers report in the February issue of Gastroenterology. The combination of NVR3–778 and interferon prevented viral replication and HBV RNA particle production to a greater extent than either compound alone or entecavir. An estimated 257 million people are living with HBV infection, defined as hepatitis B surface antigen (HBsAg)-positive. In 2015, hepatitis B resulted in 887,000 deaths, mostly from complications such as cirrhosis or hepatocellular carcinoma. A vaccine against HBV has been available since 1982, but few effective treatments are available for individuals with chronic infection. Nucleos(t)ide analogs such as entecavir are effective, but do not completely prevent disease progression and need to be taken for life. Capsid assembly modulators bind to the HBV core protein, which assembles into capsid structures that enclose viral pregenomic RNA, the viral polymerase, and host proteins. HBV DNA formation occurs inside assembled capsids, where pregenomic RNA serves as a template for the viral polymerase. Reverse transcription of pregenomic RNA into HBV DNA is required for formation of new infectious virus particles. Core protein assembly modifiers such as NVR3-778 are experimental HBV replication inhibitors that disrupt capsid formation. Compounds in the NVR 3-778 series block encapsidation of viral RNA, preventing production of infectious virus in vitro. Klaus Klumpp et al investigated the efficacy of NVR3-778 in urokinase-type plasminogen activator/severe combined immunodeficiency (uPA/SCID) mice with livers regrown from human hepatocytes (humanized livers). These livers can be infected with HBV and allow for cccDNA-dependent virus replication. The authors infected the mice with an HBV genotype C preparation and then waited 8 weeks for complete and persistent infection of the humanized livers, and reached a stage of stable production of HBV serum markers. Mice were then given vehicle (control), NVR3–778, entecavir, pegylated interferon (peg-IFN), NVR3–778 plus entecavir, or NVR3–778 plus peg-IFN for 6 weeks. Klumpp et al found that the mice given NVR3–778 or entecavir alone had reduced serum levels of HBV DNA compared with controls or mice given peg-IFN. The largest reduction was observed in mice given NVR3–778 plus peg-IFN—in all mice in this group, the serum level of HBV DNA was below the limit of quantification. NVR3–778 and peg-IFN, but not entecavir, also reduced serum level of HBV RNA. The largest effect was obtained in the group that received NVR3–778 plus peg-IFN, in which the serum level of HBV RNA was below the limit of quantification. Levels of HBsAg and HB e antigen were significantly reduced in only the groups that received peg-IFN. Levels of covalently closed circular DNA did not differ significantly among groups. NVR3–778 was not associated with any significant changes in level of alanine aminotransferase, the ER stress response, or IFN-stimulated genes. Immunohistochemical analysis showed that peg-IFN, alone or in combination with NVR3-778, reduced HB core antigen (HBcAg) compared with vehicle, entecavir, or NVR3-778 alone. Staining for the apoptosis marker caspase 3 and CK18 showed only few caspase 3–positive human hepatocytes, indicating an overall stable population of HBV-infected human hepatocytes throughout the study. The authors discuss the distinct antiviral profiles of the different regimens. Entecavir efficiently reduced serum HBV DNA but did not affect levels of viral antigens and HBV RNA. Peg-IFN moderately reduced serum levels of HBV DNA and antigens and strongly reduced serum HBV RNA. The capsid assembly modulator NVR3-778 strongly reduced serum HBV DNA and HBV RNA levels, but was similar to vehicle control in its effect on serum viral antigen levels. The combination of NVR3-778 and peg-IFN had the largest antiviral effects on serum levels of HBV DNA and HBV RNA and also reduced serum levels of antigen. Klumpp et al conclude that the antiviral effects of NVR3-778, entecavir, and peg-IFN are complementary, supporting investigation of these molecules in combination. In an editorial that accompanies the article, John E. Tavisand and Elena Lomonosova report that NVR 3-778 has been well-tolerated in phase 1 trials. There is preliminary data that NVR 3-778 reduces levels of HBV DNA and HB e antigen in patients, and that reductions were larger when NVR 3-778 was combined with peg-IFN. 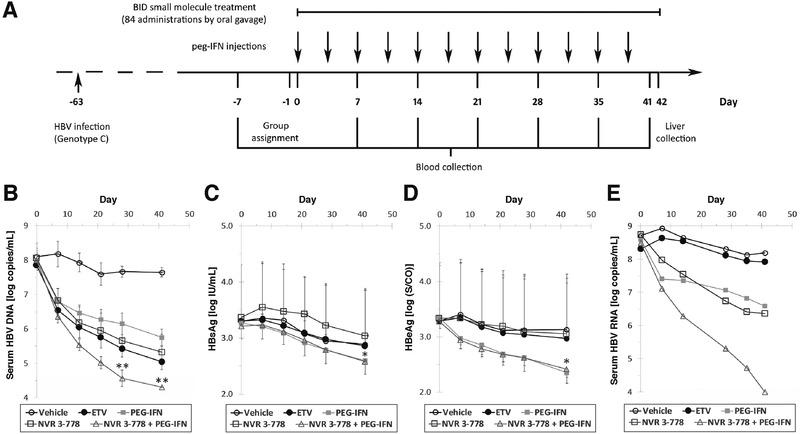 Tavis and Lomonosova state that NVR 3-778 plus peg-IFN is the first experimental combination therapy shown to exceed the efficacy of entecavir monotherapy in a relevant animal model of HBV infection. The findings support the assumption that combination therapy can be superior to monotherapy against HBV infection. However, further studies are needed to optimize dosage, determine if responses can be improved, and if peg-IFN can be reduced to minimize side effects. Dose optimization is particularly important for NVR 3-778 because a high concentration was used in the study of Klumpp et al (405 mg/kg twice per day, or 48 g/d for a 60-kg patient). Extended dosing periods should be tested to determine whether antigen levels can be further reduced and whether levels of cccDNA begin to decrease. Finally, treatment cessation studies are needed to determine the durability of the observed responses.